Mexican KO artist Marco “La Roca” Elpidio vs.
NEW YORK – October 3, 2018 – Combate Americas today announced its debut in Guadalajara, Jasico, Mexico with a star-studded Mixed Martial Arts (MMA) event headlined by a lightweight (155 pounds) showdown between knockout artist Marco “La Roca” Elipido (7-3-1) and Enrique “Wasabi” Marin (11-5), live in Spanish on Univision Deportes Network (UDN) (12 a.m. ET/9 p.m. PT) and in English on DAZN (10 p.m. ET/7 p.m. PT) on Friday, October 26. Also announced today for the “Combate Americas: La Batalla de Guadalajara” event, which will take place at Complejo Nissan de Gimnasia, was a featured, bantamweight (135 pounds) matchup between rising stars Victor Hugo “El Periquito” Madrigal (6-2) of Guadalajara and Christian “El Taylon” Quinonez (12-2) of Zacatecas, Mexico, and a flyweight (125 pounds) scrap between unbeaten phenom Edgar Chairez (4-0) of Mexicali, Baja California, Mexico and Axel Osuna (3-1) of Guadalajara. “It’s war. Like no other fight in history, this lightweight fight between La Roca and Wasabi comes down to who will rule Guadalajara,” said Combate Americas CEO Campbell McLaren. Elpidio, a 5-foot-8, 25-year-old powerhouse from Mexico City, Mexico, enters La Jaula, the Combate Americas cage, for the fifth time in his career, and will look to return to the win column after suffering a unanimous decision defeat at the hands of recent “COPA COMBATE” tournament qualifier Andres “The Bullet” Quintana in a featherweight contest in Tijuana, Baja California, Mexico on May 18. The 32-year-old Marin of Seville, Andalusia, Spain was a runner-up on season two of The Ultimate Fighter: Latin America competition reality television series. He will make his much-anticipated debut in La Jaula. To date, Marin has earned 8 of his 11 professional career wins by way of (T)KO or submission, including a second round (5:00) TKO (Doctor Stoppage), in his last start, of Yuki Yamasaki in Las Palmas, Spain on March 17. 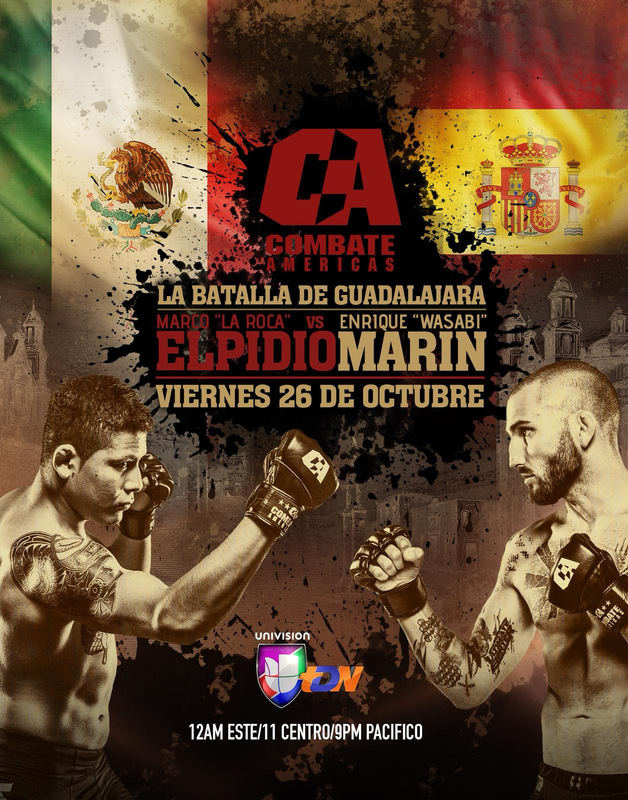 In other action at “Combate Americas: La Batalla de Guadalajara,” Alejandro “Pato” Martinez (15-2) of Puerto Vallarta, Jalisco, Mexico will take on Jordan Beltran (9-4) of Puebla, Puebla, Mexico in a 150-pound catchweight contest. In women’s atomweight (105 pounds) action, resilient battler Brenda Enriquez(1-2) of Salt Lake City, Utah, USA via Chihuahua, Chihuahua, Mexico will duke it out with Alitzel Mariscal (0-0) of Guadalajara. A lightweight affair will pit Leo “Lion” Rodriguez (11-2-1) of Mexico City against Ramon “Monchi” Lopez (5-2) of Hermosillo, Sonora, Mexico. Alejandro “Goliath” Solorzano (3-2) of Guadalajara will do battle with Mike “Tosko” Villareal (1-1) of Monterrey, Nuevo Leon, Mexico in a heavyweight (max 265 pounds) throwdown. Luis “El Dragon” Ceron (5-3) of Tuxtla Gutierrez, Chiapas, Mexico will lock horns with Jose Alberto “Hoodler” Martinez (4-2) of Guadalajara at featherweight (145 pounds). Unbeaten Guillermo Torres (1-0) of Guadalajara will face Mario Tena (5-1) of Monterrey at bantamweight. In a meeting between two pro debut competitors hailing from Guadalajara, Bryan Arreaga (0-0) will square off with Marco Messi Dominguez (0-0).